Well, so much for posting on my third blogiversary (3 December)! 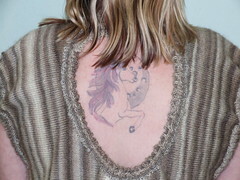 I've been knitting my little fingers to the bone to complete a private commission which I actually took on in April. I didn't realise at the time how long it would take me to produce the Simply Knitting plus-size set, and poor Penny (the commissioner) has been very patient. She has been planning this jumper in her head for years, because she's never seen anything similar in the shops. 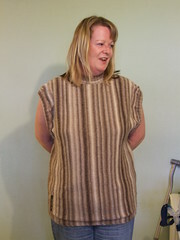 She wanted a sleeveless polo neck, hip length - with a ten-inch diameter circular hole in the back to show off a tattoo... Well, the jumper itself was no problem (except that she wanted it in Rowan Tapestry with the stripes running vertically, so I had to do it side-to-side), but, oh, that hole!! I was panicking all the time I was working on it, in case it was in the wrong place, or too big, or too small, or not round enough. Eventually, the Beamish Boy made use of his maths training, and worked out how many stitches I had to lose (or gain) on each line, and produced me a chart for the first quarter of the hole, which I then had to read backwards or upside down for the other three quarters. Success! One perfectly round hole, which I then had to edge with ribbing and find a way to cast off, flat. After three days of experiment, and two reknittings of the entire rib, I cast off using a crochet hook, with 3 chain stitches between each cast-off stitch. Next I made a crochet chain and threaded it through the 3-chain loops, drawing it up to the required size. Even then, it came out rather oval, from the weight of the garment pulling on it. I've never had such a reception for anything I've made, in any way, ever. I hadn't realised how personal and important this jumper was to her, until I saw her tears of happiness over it. I admit I was pleased with it myself, but she was ecstatic. It's lovely to get such a personal response! Tigger says, "I hope you're not expecting me to stick those pipes up my nose..."
Hi Heather, the photos don't do Penny's jumper justice. It is gorgeous. No wonder she was so pleased. Have a great Christmas. Cats are far too cunning to be allergic to themselves. It'll be his way of making you get rid of something in the house that he doesn't like. I hope you have a lovely Christmas. I *do* like that jumper! My name is Susan Harwood. I'm contacting people who list Green Politics as an interest on their 'blogger's profile'. It is concerned with the environment, building, architecture, politics and education. It is in its very early stages just yet - so comments will be especially welcome!